After many years avoiding martial arts and just training in the gym, in 2006 I decided I wanted to change my routine and find a way of training as part of a club in a group environment. I initially joined a kick boxing club training under Sifu Rebecca Kane. After a few weeks training I decided I wanted to do more classes so joined Phantom Tiger Taekwondo at Total Fitness under Mr Malcolm Armstrong. I continued training in both disciplines at the same time but as my training progressed I began to prefer the format and style of Taekwondo and so, despite having achieved my blue belt in kick boxing, I switched to train solely at Phantom Tiger. When I started training I never imagined that I would become a 3rd Degree Black Belt and Head Coach of Phantom Tiger Taekwondo. I love being able to see the development and progression of students through their Taekwondo journey with different students excelling in different areas. Outside of the Dojang I can often be found climbing, walking and cycling. I joined Total Fitness gym in Huddersfield in September 2004 and saw an advertisement for Taekwondo classes starting the next week. Initially joining the class as a good way of staying fit and forcing myself to use the new gym membership. Joining Phantom Tiger Taekwondo in October 2004, I trained twice a week under Mr. Malcolm Armstrong, 3rd Deg, and had my first grading with Miss Pam Hardy, 4th Deg, in the December of that year. As well as attending regular classes three times a week I also undertook supplementary training with Mr. Paul Goddard, 3rd Deg, (Ultimate Taekwondo, Bradford), Miss Hardy (formerly Golden Tiger Taekwondo, Bradford) and Mr. David Cliffe, 4th Deg (Total Taekwondo Martial Arts School, Huddersfield). I graded to 1st deg with Grandmaster Paul Liversidge, 9th Deg, on 13/07/08 in Headingley, Leeds. Following the retirement of Mr. Armstrong in September 2010 I took a coaching position, helping with the coaching of both the junior and the senior classes. I began attending classes at Leeds University Union Taekwondo Club in February 2011 under Mr. Andrew Murray, 6th Deg. In 26/03/11 I undertook my 2nd Deg grading in front of a panel headed by Mr. Murray. Promoted to 3rd Deg on 18/10/14 by a panel headed by Master Murray. I also recently attended classes in WTF Taekwondo and have attended seminars on Kempo Ju-Jitsu, Judo, Kickboxing, Muay Thai and Escrima. I have competed in sparring (point stop and continuous), destruction and patterns at interclub and open competitions in both TKD and kickboxing. A few years later she discovered judo and spent her university years competing for and captaining Glasgow and the Scottish Universities division. She still finds it very hard to avoid opponents somehow ending up on the floor with their arms in uncomfortable places! On a trip to the gym one day, the new Taekwondo club was practising in the next door studio. The invitation to kick people in the head turned out to be unmissable and she’s never looked back. Some thirteen years or so later, Rhona is a third Degree Black Belt and Taekwondo and Tykes instructor. She is also our child safety representative and holds an anti-bullying diploma. Rhona particularly enjoys bringing some crossover martial arts techniques into training and making sure students have some basic takedown, groundwork and self defence skills. She also loves seeing kids who have never previously been the ones to excel at sport master Taekwondo techniques and realise just how good they can be as their confidence grows. Outside the dojang, Rhona works with all sizes and species of animals in her job as a veterinary surgeon, which she reckons is a lot safer and less challenging than the average Tykes class! Paul Wood began his martial arts career much later than most. At the age of 39 he took his children to practice karate. Although he enjoyed it, it didn’t really excite him, so after a year, he and his children switched to taekwondo, under the tutelage of Mr Malcolm Armstrong, also known as the Phantom Tiger. As the years went by, Paul’s children went on to other things, but Paul kept at it as it was the only sport he had ever really enjoyed. He had a secret ambition to earn a black belt but never thought he could do it. However, he has always believed in the tenets of taekwondo and after a lot of hard work he was awarded his first degree in 2011 at the age of 45. Paul is now one of our coaches and he feels proud to be able to pass on his knowledge to our students. He is now working towards his third degree, but at the age of 53 and having suffered a series of injuries, it will the hardest test he has ever undertaken. He just reminds himself of the tenets. 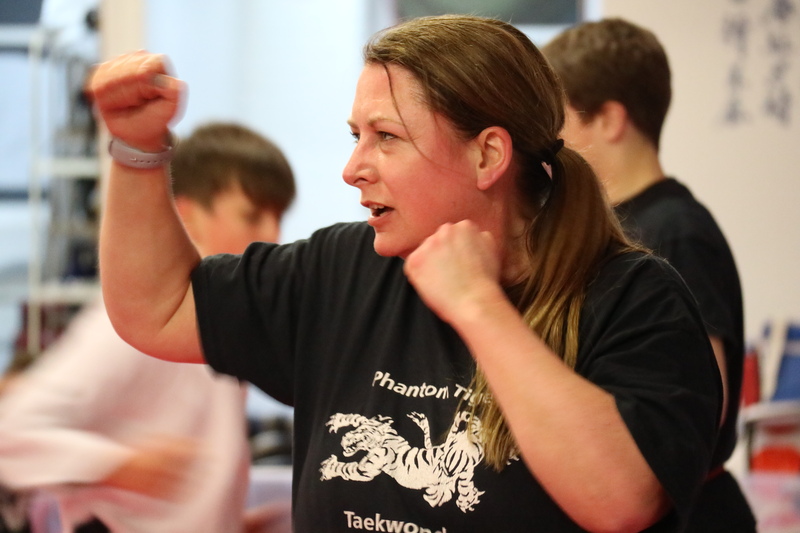 Nicola started martial arts when she joined a taekwondo club in Fleetwood at the age of nine. She was very quiet at school (unlike now), but learning taekwondo allowed her to enjoy school in the confidence that she could deal with any school bullies. On one occasion it also gave her the confidence to respond to an adult stranger who approached her in a park and tried to start a conversation. As a child, she found that she gained valuable life skills from learning taekwondo, including respect for others, discipline, working together in a team, and social skills developed through meeting new people in a fun environment. And not forgetting the great physical and mental health benefits too. 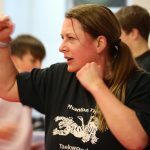 Nicola later joined various different taekwondo clubs as she went to university and relocated, but finally settled in Huddersfield where she joined the Phantom Tiger taekwondo club in 20??. She loves breaking boards and the technical aspects of taekwondo. Having a 14 year old daughter, who is also a member of the club, she takes great pleasure is supporting all young children develop the same skills she did as a child. It is Nicola’s goal to get to black belt before she is 50 and she is working towards her back belt grading in March 2019. 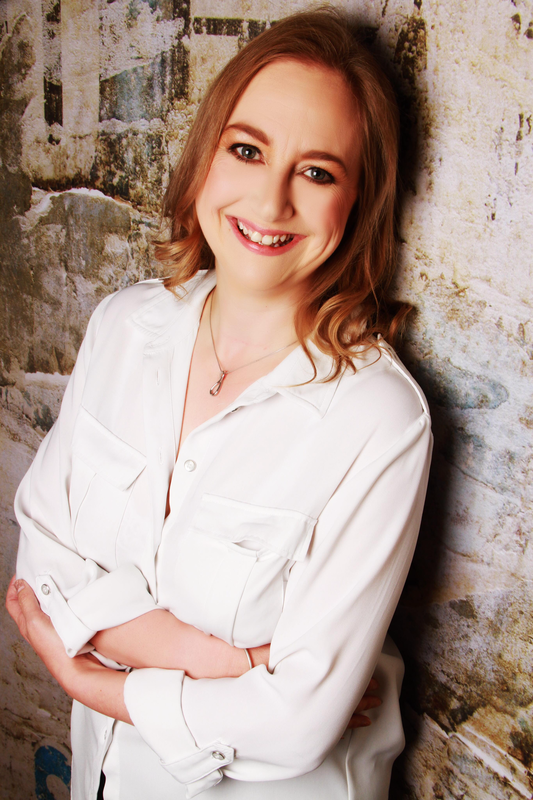 Outside of the club, Nicola has her own business offering career coaching to individuals and HR consultancy for businesses. Certainly some of the people she has disciplined over the years have been given the chop…but she has always remembered the taekwondo tenant of self control. I started my Taekwondo journey just over 2 years ago when I attended a ‘Bring a Parent to Taekwondo’ session with my two sons who have been with Phantom Tiger for over 5 years now. Before I knew it I had a white belt and was on the register. I was hooked. Being a later starter to the world of martial arts and Taekwondo, I have been so impressed at how holistic an activity it is. Strength, fitness, self control, teamwork, self defence, discipline and respect. I have achieved more than I ever thought possible and my goal is to achieve my black belt. I just need to stop picking up injuries along the way! As a parent, it has also been an amazing experience to do an activity with my children where they are more skilled and know more about it than me. I particularly enjoy working with the younger students as they embark upon their Taekwondo journey, and seeing their confidence in all aspects of life develop and grow. 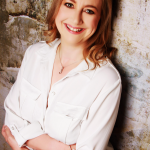 Outside of the Dojang I run my own consultancy business and, as well as being a full time taxi for my boys, enjoy horse riding, tai chi, gardening and pilates.